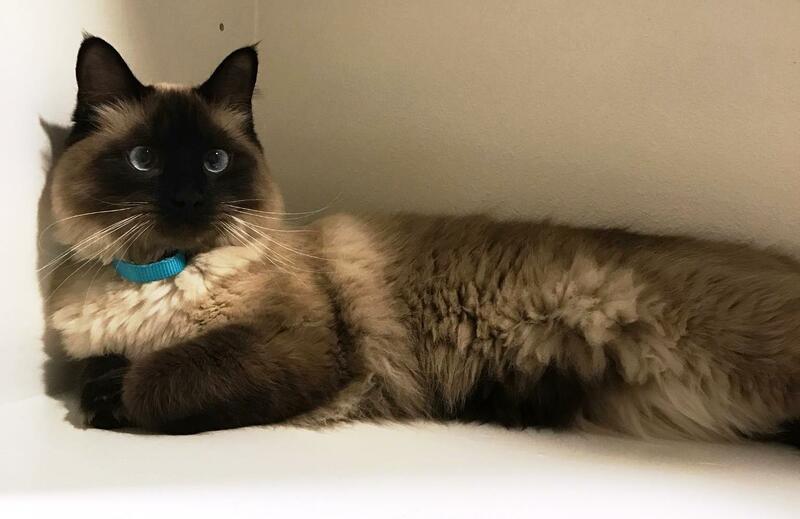 Alex is a one-year old Persian Ragdoll indoor cat who found an opportunity to slip out the door, and he took it. 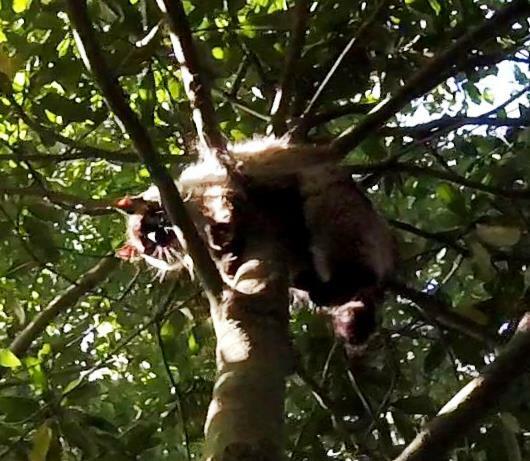 He quickly got stuck 20 feet high in a skinny tree, but Renita found him and called me that same day. 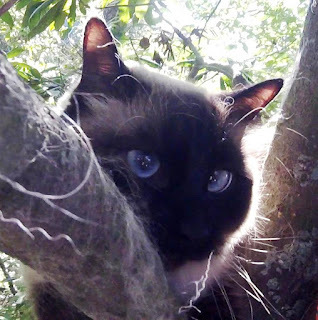 By the time I got there, Alex had been in the tree only half a day, but he was in an uncomfortable spot and was more than ready to get back home. 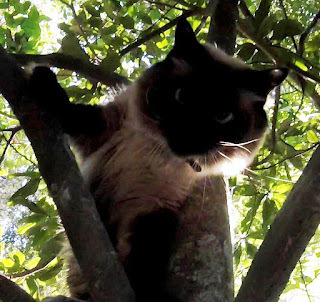 Since Renita told me that Alex is a very friendly boy, I was expecting him to cooperate in the tree. Indeed, once I climbed within reach of him, he welcomed me and let me pet him. I knew he was uncomfortable trying to balance his large body on those skinny limbs, so I assumed he would be happy to walk into a carrier with its large, flat floor where he could stretch out and get comfortable. I was wrong. When I presented the carrier to him, he recoiled. Apparently, he associated the carrier with a trip to the vet, and there was no way he was going in there. I quickly put the carrier away. I climbed up a little higher where I would be in a better position to scruff him and put him in a bag. He remained comfortable with me as I prepared to bag him. I slowly but firmly scruffed him and lifted him off the branch. He handled the scruffing well, but when I began to pull the bag over him, he started fussing. Once completely in the bag, he had a bit of a hissy fit. If I were to translate his language into English, I would not be able to repeat it here. But fortunately, I had him secured in the bag, and I was not going to let the cat out of the bag now. I brought him down and his family released him inside. 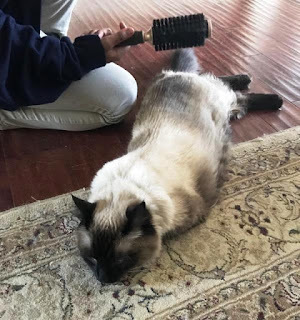 They fed him and gave him a good brushing. After all, a cat with a thick, long coat like his needs frequent brushing. He is doing well now and very happy to be back in the luxury of home. Thank you, Renita, for providing these after-rescue pictures.